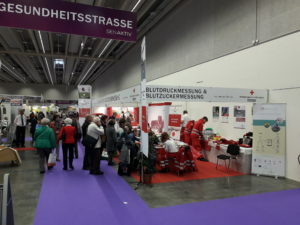 The Red Cross Innsbruck presented FairCare at the popular SenAktiv fair 2017 in Innsbruck. It took place at the exhibition hall at Innsbruck/Austria. The main topics at the fair were among other things ‘health & nutrition’, ‘prevention & safety’ and ‘media, technology & computer’. Appropriate to the topics, the Red Cross informed older adults, their relatives as well as professional institutional care givers about FairCare.